New Purina Impact Horse feed is a performance feed available June 2017. 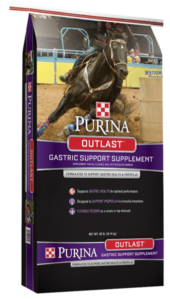 Gastric Outlast supplements are also available in new Race Ready GT, Ultium Gastric Care and Purina Outlast horse feed. Keep any eye on our Facebook page and we’ll let you know when they arrive. Interested in doing a feeding trial with Purina Horse Feeds? Contact us at our location and we can get you the details. With Purina, you’ll not only feed your horse quality but you’ll feed them more efficiently in the long run. With Purina horse feed, you’ll feed less and see more positive change in your horse. Give us a call at, 830-997-2256, or come by to get started. This entry was posted on Tuesday, May 23rd, 2017 at 2:47 pm	and is filed under News & Updates. You can follow any responses to this entry through the RSS 2.0 feed. Both comments and pings are currently closed.